Have you ever heard of Passion Play Ministries International? It is an organization that tells the message of the death and resurrection of Jesus to thousands of people in many nations and cities in the US and around the world through a live-action drama. The play is a large production with hundreds of people in the cast and part of the crew. The headquarters for this ministry is in Farmington, NM of all places. Yet, with such a humble headquarters location they are doing great ministry in spreading the gospel of Jesus around the world. 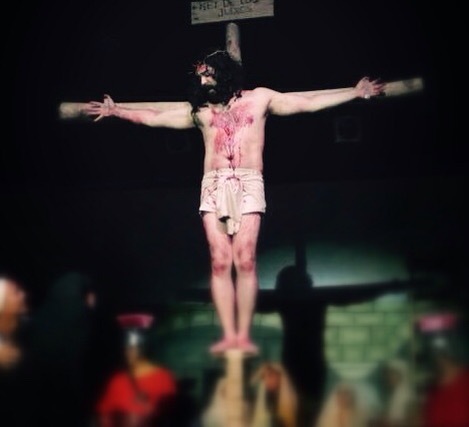 I was privileged to get involved with the Passion Play of the Four Corners last year for the first time. My wife saw an ad somewhere stating that they needed singers, and that is something I love to do, so I decided to join. I was part of the choir last year and sang in the opening song as a trio with a couple other ladies. I was also the host pastor for a night where I got to lead the opening prayer and then invite people to respond to the gospel message at the end. It was an amazing experience, and I can truly say they are changing lives – not only lives in the audience, but even lives within the cast and crew itself. This year I went back to audition, and I was told that the choir was going to be practicing on Tuesday evenings. Well, I am solidly booked on Tuesdays with my position as den leader for the local cub scout pack, so I decided to do some reading and see if God wanted to use me for a speaking part this year. Apparently He does. I was told that night I was to report to the Sanhedrin block when rehearsals began. The Sanhedrin? I was to be one of the bad guys who connived to have Jesus crucified. These were the legalists that had missed the heart of the message of the Messiah and therefore missed Him when He came to them. Oh well, if that was where God wanted me to be then so be it. I began to read, and after a few nights the director of the Sanhedrin block of the cast informed me that he wanted me to play the part of Caiaphas. Really? Not only was I going to be a bad guy, but I was to be the worst one – the High Priest!! As I have been learning my lines and preparing for my role it has really weighed on my heart the severity of the role I must play. I have to be angry at Him. I have to accuse Him. I have to reject Him. I have to be all the things I preach against each week as I minister. Sure, this is only a play, but the weight of the things, I must sa,y hang no less heavily on my heart. The one idea that keeps coming back to me, though, is this: The religious leaders of the day – the Sanhedrin – rejected Jesus and everything He stood for because they didn’t understand Him, and they were threatened by His doctrine as they saw it required a change in their way of life and livelihood. Don’t we do the same thing? Don’t we reject Jesus as we decide day after day to give in to our selfishness instead of allowing Jesus to reign in our lives and call the shots? Don’t we ignore Jesus as we get caught up in our lives or even worse, our religion? Don’t we reject Him as we feel that following Him would require a change of lifestyle that will threaten our comfort on every level, even fincially? Are we not just as guilty as the Sanhedrin? That verse is for us too. We crucify Jesus when we put our selfish desires above His. What does Jesus require in response? Repentance and Baptism (Acts 2:38). When you understand what you’ve done and keep on doing to Jesus it should bring about remorse that leads to repentance. When you see what He has done for you by willingly dying for you in spite of your rejection it should inspire a desire for allegiance to Him that leads you to baptism. Don’t stay like the Sanhedrin. News is that even Caiapha, after the resurrection, became a follower of Jesus. It’s not too late for you to follow Him either. If you would like to know more about Passion Play Ministries International you can find them on the web at www.passion-play.org.